Gregory Palamas was born in the city of Constantinople in 1296. His father was a prominent official under Byzantine emperor Andronicus II Palaeologus. His father died while Gregory was an infant, and the emperor actively took a part in Gregory’s formation and education. Intelligent and hard working, Gregory was destined by his imperial patron for government service. But at the age of 20, Gregory left government service to take up monastic life at Mount Athos. Advancing in monastic life under his spiritual mentor (St.) Nicodemus of Vatopedi, he eventually became a priest and hermit at the small monastery of Glossia on Mount Athos. During this time he absorbed the teachings of such church fathers as Evagrius of Pontus, Macarius of Egypt, and Simeon the New Theologian. 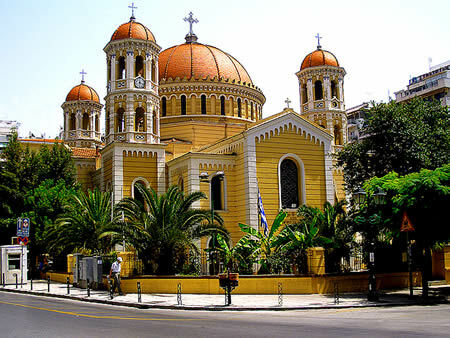 Moving to Thessalonika, he became a noted priest, preacher, and teacher while maintaining a strict monastic regimen. He gathered a small community of solitary monks around his church and began actively to teach the “Hesychast” (from the Greek hesychia meaning “calm, silence”) method of prayer and theology. During the 1330s Gregory was called to Constantinople to defend the Hesychasts against the “Scholastic” teaching of the Italo-Greek monk Barlaam of Calabria. Barlaam taught that one could not “know God” through mental prayer. Influenced by Thomas Aquinas he insisted that knowledge of the existence of God could only be appropriated through intellectual activity. He ridiculed the teachings and prayer methods of the Hesychasts and attempted to disprove the Hesychasts’ claim to experience God through “the light of Tabor.” (Tabor was the place where Jesus [Christ] of Nazareth experienced his “transfiguration” into divine brilliance and energy.) Palamas’s most extensive written response to Barlaam was Apology for the Holy Hesychasts, commonly called the Triads. 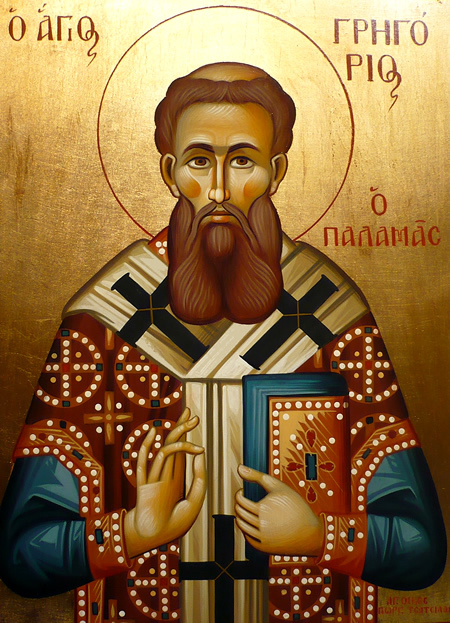 Palamas’s defense established the theological basis for the whole human person’s (body, spirit, and soul) being involved in the mystical experience. The whole person can be deified or united with the divine energies of Christ’s Tabor experience. This deification or “theosis” ultimately includes body, soul, and spirit, so a person enters into a real, but mystical union with God. In this incarnational way Palamas and the Hesychasts attempted to experience the presence of God through “divine energies.” Palamas helped to define the difference between the “divine essence” (which cannot be known) and “divine energies” (which can be known through how humans experience God’s presence). Palamas’s teachings were accepted as orthodox at the Council of Constantinople in 1341, and Barlaam was condemned as a heretic and fled to Calabria. This did not end Palamas’ troubles, as Barlaam’s followers among monks and high clergy continued to dispute Palamas. He was imprisoned from 1344 to 1347. But after his release by Patriarch Isidore, he was elected archbishop of Thessalonika. During one of his trips to Constantinople, he was captured by pirates. He was beaten and tortured for preaching the Gospel to his fellow captives and captors. After a year he was ransomed and returned to Thessalonika. Palamas performed many miracles during his reign as archbishop, including healing many illnesses. He died on November 14, 1359, and was canonized by a church council in 1368. He is commemorated in the Byzantine Church on November 14 and the second Sunday of the most solemn season of the church, the Great Fast or Lent.